Please also take time to review the Standard guidance for CTK lectors. There is a wonderful group of men and women who clean the church on a weekly basis. They do an outstanding job in making the church look beautiful for Sunday and daily masses. Anyone is welcome to come along and sing with the choir which leads the singing at 10.30 mass. There is a special scratch choir for Midnight Mass - rehearsal details in parish newsletter in December. First Saturday evening of each month during term time. Contact Sharon Perreira on 07941 381 755. This group works to promote justice and peace. The group meets regularly and is always on the look out for new members. To get involved, please contact clarecollinsuk@aol.com. 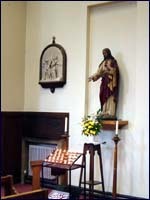 The Depaul UK group was set up in this parish in 1992. It came into existence because of the need to help the young (16 to 25 years old) homeless in London. The main purpose of the group in our parish is to raise funds, as the parish is very fortunate not to have the problem of homelessness on the streets of Wimbledon Park. This does not mean that the problem can be ignored; so the parish group asks for your support for its Christmas gifts collection, quiz nights and other fund raising activities and special needs collections, which are arranged from time to time. Anyone wishing to join the group or to have more information please email alicia.holliday@blueyonder.co.uk. The international society is run by laymen and women of all ages in parishes, universities, colleges and schools, meeting weekly to arrange visits to those in need, and offering spiritual and material support as and when it is needed. The conference (the name by which these groups are known) meets regularly in this parish in the church hall on third Monday at 8.00 p.m., when after prayers, members report on the previous week's activities and make plans for the coming weeks. Work covered by the conference in this parish consists mainly of visiting the sick and the housebound. While you may not be in a position to become involved in the active work of the society you can always help with your prayers; there is an auxiliary membership available to those who could help in this way. You can also help in the work of the society by letting one of the active members know of any problems with which they may be able to help. Meetings alternate Thursdays 8.00 p.m. in the Presbytery. Contact Michael Jones on 020 8874 0115 for more information. Anyone willing to support Paul would be very welcome.